7 p. : 27 cm. "Avery S. Hoyt, Acting Chief, Bureau of Entomology and Plant Quarantine." 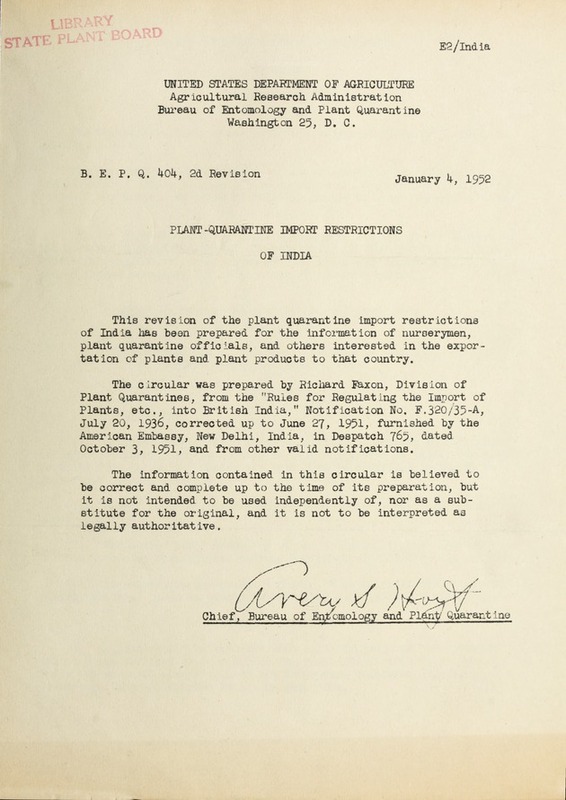 tation of plants and plant products to that country. October 3, 1951, and from other valid notifications. and to impose penalties for infractions of the said rules. products from the United States to India must be certified by the U. S.
packing material used in packing or wrapping such plants or seeds. Coimbatore, may be imported by him by such post. pose of introducing such insects. West Indies except by the Director cf Agriculture, Madras. signed by a competent authority. (iv) The Import of sunflower seeds from Peru and Argentina is prohibited. leaving the plant material and as are not opened in any part of India. the purpose of introducing such parasites. that they are free from injurious insects and diseases. thoroughly examined on the (date). . . . by (name) . . . . Inspected in the field by a duly authorized inspector on . . .
No. and description of packages . .. . .
Distinguishing marks . . . . . . . Description of plants or plant products or parts thereof . . . . Exported by . . . . . . . . . . . . . .
Name of vessel or particulars of route . . Date of shipment . . . . . . .. . . * . Additional Certificate (s) attached.. . . .
healthy potato orop; and . Fusicladiun nmaorosporim, and. Oidiui. heveae. meet the cost of such examination as it may direct. letter or sample post or otherwise than by sea (See also 13 and 14 (2)). a certificate of origin signed by an authorized official. be imported by sea or by air. seed shall be examined on importation by such officer as the Central Govern-. examination shows that refumigation is necessary. not include cottonseed or unginned cotton. (ii) "American cotton" means all cotton produced in any part of America. (v) "Round Bale" means a bale not exceeding 270 pounds. ports of Bombay and Madras. prescribed by the local government. Bombay or Madras Customs House fumigation chamber. baggage or by any other means. "w~ ~ EE :' A- .